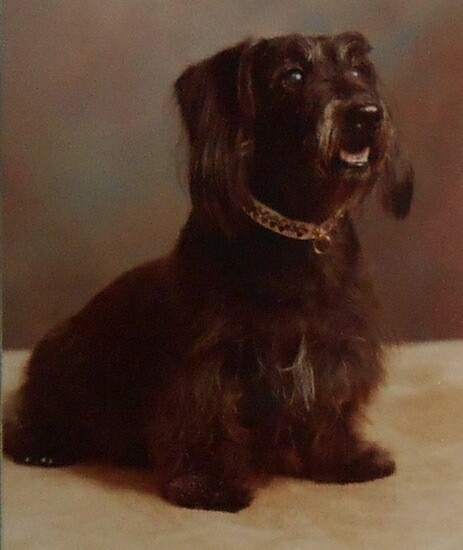 Tobie the Doxiepoo at 7 years old—"Tobie was the smallest puppy in the litter and had the least hair. His mom was a brown smooth coat Dachshund. His hair ended up being about 3 inches long, but I kept it trimmed like a terrier. He was social, like most dogs and kids, but did bark. Tobie had the best temperament, and was very smart. He aced obedience class, knew 50+ words, and had his own doorbell. Everyone wanted to own him. He did have some skin + ear problems, and his heart ended up being bad. He lived to be 11 years old." 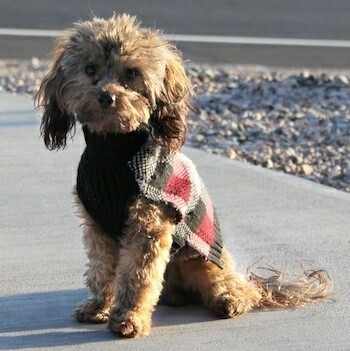 The Doxiepoo is not a purebred dog. 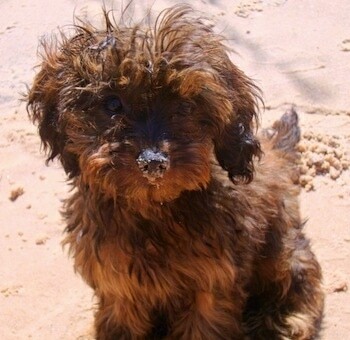 It is a cross between the Dachshund and the Poodle. The best way to determine the temperament of a mixed breed is to look up all breeds in the cross and know you can get any combination of any of the characteristics found in either breed. Not all of these designer hybrid dogs being bred are 50% purebred to 50% purebred. It is very common for breeders to breed multi-generation crosses. 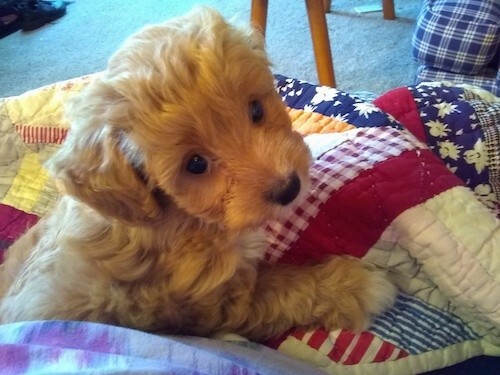 "Bubba the Doxie Poo at 6 weeks old—he is 1/2 teacup Poodle and 1/2 miniature longhaired Dachshund." "Bubba is about 9 months old in this picture. 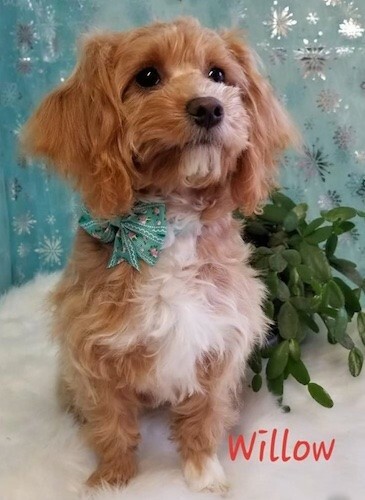 He is just under 5 lbs. He loves swimming, digging in the sand, going on walks, and he is an absolute sweet, cuddly dog. He is great with other dogs, especially big ones. His "cousins" are Golden Retrievers and he loves them to pieces. 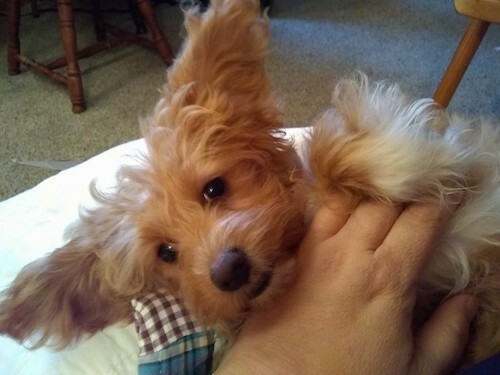 He is very mellow, rarely barks and is an all-around great little addition!" 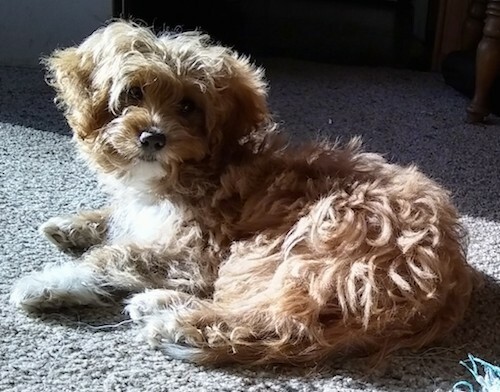 Willow at about 6 months old—"Willow is a mix of long-haired Dachshund and Toy Poodle. She is an incredibly clever and sweet-natured dog, abounding in personality and charm." Willow at about 6 months old—"She is perhaps the most athletic and physically dynamic dog we have ever had, and she is only 6 months old. Her energy seems boundless which makes her a great companion for our adolescent daughter. She has proved to be rugged and dauntless when playing outdoors and yet is also perfectly content to be indoors." 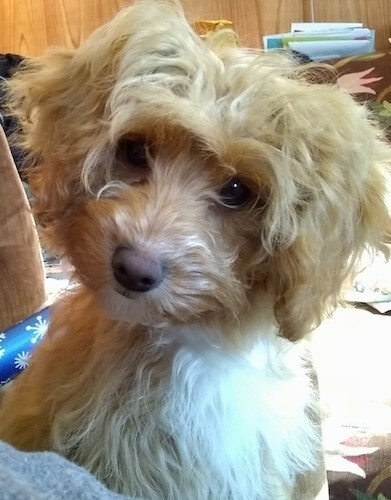 Willow at about 6 months old—"Although incredibly poofy, underneath all that coat is a Dachshund shaped lithe little body. She hardly sheds and her coat is very thick and prone to tangling. We will soon be looking into managing this by doing some light trimming. " Willow as a young puppy—"We have had Dachshunds before, and although they were very nice dogs they did not have that extra spark of intelligence and personality which we've found in Willow."